On August 23, 2013, Sean Boushie met with Officer E. Smith at the Missoula Police Department and told him that Bill Windsor files frivolous legal actions to get legal settlements to make him go away. This false police statement is evidence that caused Bill Windsor to be standing trial for five alleged crimes. “Mr. Windsor will send an email to unsuspecting people accusing them of some type of harassment or crime, and when they respond, he initiates an ongoing harassment campaign. He apparently also files frivolous legal actions against these people in hopes of getting them to reach legal settlements with him just to make him go away." This is absolutely false. Bill Windsor has never emailed any unsuspecting people, and he has never harassed anyone. Bill Windsor is the victim of the largest case of cyberstalking and defamation in U.S. history by Sean B**shie and the Joeyisalittlekid Gang. Bill Windsor has never filed a frivolous legal action in his life, and he has never sought a settlement from anyone he has sued. This never happened, and there is no evidence that it did. 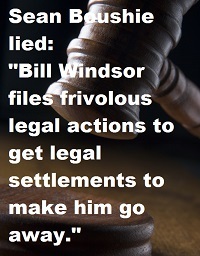 Bill Windsor has never filed a frivolous legal action in his life, and he has never sought a settlement from anyone he has sued. This is a complete fabrication. This one is simple. Ask Sean B**shie to produce evidence that Bill Windsor ever sought a legal settlement from anyone he has sued. 1. Require Sean B**shie to provide evidence. Get copies of evidence that Bill Windsor ever sought a legal settlement from anyone he has sued, and get the names and contact information for any such unsuspecting people. 2. Review Bill Windsor's legal records.